Jerome last played in South Africa for Vasco da Gama, as a striker. Born in Lobatse, Ramatlhakwane has played in Botswana for Mogoditshane Fighters and Mochudi Centre Chiefs, in Cyrpus for APOP Kinyras Peyias, and in South Africa for Santos and Vasco da Gama. 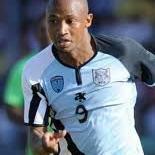 Ramatlhakwane made his senior debut for Botswana in 2006, and has appeared in FIFA World Cup qualifying matches.